Civil War Letters and Diaries of Pvt. 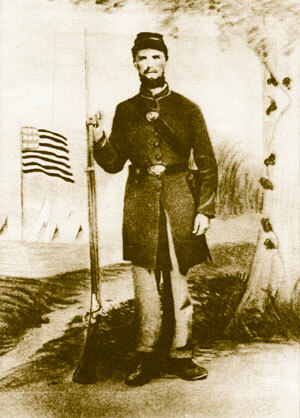 Joel Molyneux, 141st Pennsylvania Volunteers. Following previous pages 4-8 with Index of Service Records of Confederate Soldiers 1861-1864, kindly sent by Marie Mx Spearman, it is perhaps appropriate to follow on with Mx related material to the Civil War in US 1861-65. Dead & Wounded in the Civil War. 1861-1865. Estimates of Confederate losses may be low, for accurate figures are not available. For total losses, deaths and casualties due to capture must be added. The mortality rate of Union prisoners in Confederate prisons was about 15%. Of the 194,000 Union prisoners incarcerated in Confederate prisons, about 30,000 died. There are 12,912 marked graves of Union prisoners at Andersonville Prison. Of the 214,000 incarcerated Confederate prisoners, approx. 26,000 (12%) died in captivity in Union prisons. Also, there was mortality due to disease, accidents, suicides, executions, murder, killed after capture, drownings and unknown. Total losses may double the above figures, thus we may come up with over 2 million total casualties. After finishing the other sheet (previous letter) and getting it ready for mailing tomorrow morning, excepting the sealing, our officers came around and told us to brush up and be ready for receiving visitors. Of course, we dusted our clothes and combed our hair, etc. At four o’clock P.M. our regt. was marched into an open field. Also, the 68th Pa. and the 114th. The 114 is a regt. 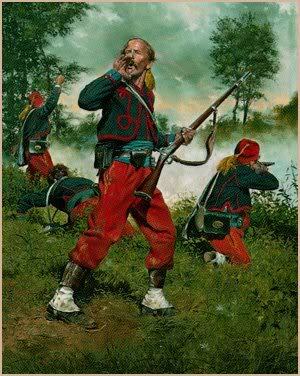 of Zouaves .... .Their uniform is red pants, blue round about red cap with a white woolen scarf wrapped around forming a sort of a turband (turban) and a large yellow tassel attached to the cap to top it off with. It seems Governor Curtin had sent us our flags by hand of Adjutant Gen. Thomas. He presented one to each of the colonels of the regiments; with a short and very appropriate address. He said he entrusted us with the flag which he hoped would lead us to victory; that we should protect it and never desert it, and when this wicked rebellion was wiped out we should return it to the archives of the state to be preserved as a memento of our patriotism, bravery, and suffering. We have two brass bands in our brigade. One belongs to the 68th Regt. The other to the 114th Zouave Regt. Ours have not any - only drums and fife. Zouaves-Fr. infantry corps originally recruited in Algeria from the Zouawa, a tribe of Berbers, but later drawn from Fr. their full dress is a semi-Moorish uniform. Zouawa- Kabyle tribe of Algeria in the Atlas Mountains; Fr.Zouave regiments named after the Zouawa tribe of the Kabyles. (Algeria became a part of France in 1842). Your last two letters reached me the 28th. Was glad to get them though they had been some time upon the way. My health is still very good. The diarhea that troubles most people down here, that have been brought up in the North, I have not been affected with since last fall. W. Rogers wrote me the 6th. He is at Phil(adelphia) still and doing well. I learn from his letter that Thomas Molyneux had been down to Gettysburg to see if anything could be ascertained about Samuel. (Thomas was Samuel’s next older brother, b. 1827. Thomas was married to Elizabeth Huckell. They had 5 children -Thomas and Samuel were cousins to Joel.) I suppose t’would be some satisfaction but quite a small chance of getting any tract of him (Sam.) I wrote to them a short time ago, after I thought all possibility of hearing any more was in vain. Very few prisoners were taken by the rebs. in that part of the field where our regt. was so badly cut up. Only those that were wounded and could not get to the rear, and these were left when they retreated. One of our co. T. Phillips of Davidson, was in their hands in the manner for a while and his story in regards to Sam, I fear, is correct. Phillips was shot through the arm and also through his right lung. He states that Sam in the action was right behind him and when our boys were falling the thickest he noticed some one fell nearby where Sam had stood but only just had one glance at him and at the time he thought it was Sam that fell as though he was shot dead as he was not positive it was he. I did not write this to his folks the first time I wrote for I had some hopes I would hear of him through some source, but now think Phillips' account is only too true. I think P’s wound would prove mortal but have not heard of him since we left Gettysburg. If he has, ‘twill make 8 of the 24 that went into the right of our co. that were killed and since died of their wounds. We are expecting to get our pay for two more mos. today or tomorrow, up to the 1st July. James has some 8 months due him - do not know about sending it home yet. If I really knew anything about the war or how things were working I would tell you all I know 'tis a big thing and know as little what really has been done as what is to be done. I have just seen the president's reply and Gov.Seymour’s letter. I think that old Abe is about right and that Seymour Fernando Wood, with some others, are a devilish sight worse than Jeff Davis every dared to be ..Give my love to all our folks and write soon to your brother, Joel.